This DIY make your own paint recipe uses ingredients you likely already have in your pantry right now! 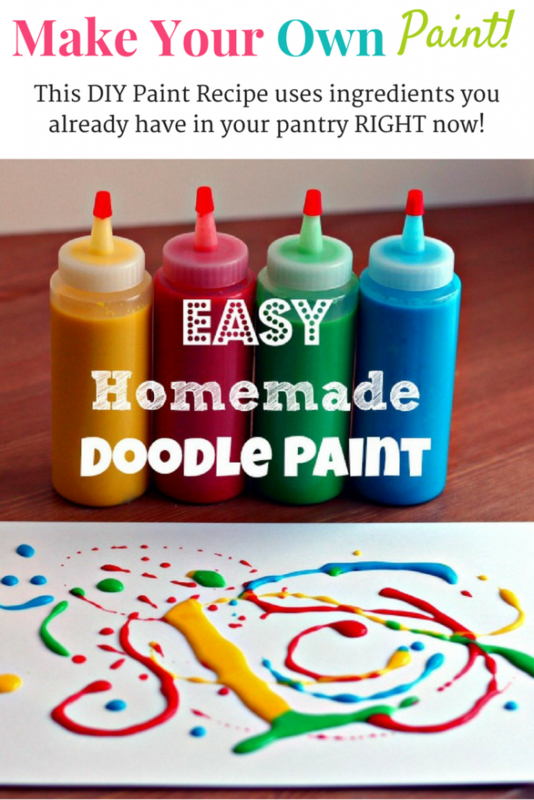 This fun paint recipe for kids is super easy to make and there are endless possibilities for your kids to create! Even better, it is technically edible paint, so even your littlest ones can experiment! My kids love to paint! We go through a lot of paint in this house, so when I saw this super easy make your own paint recipe on Pinterest, I knew I had to try it out right away. First off though, I had to track down some squeeze bottles. I ended up using the Wilton Cake Decorating squeeze bottles (they are super cheap on Amazon!) that I found at Michael’s. Everything else I had in my kitchen already. For this recipe you need equal parts salt, water and flour. Apparently, a little birdie in this household has misplaced or thrown out my table salt however, so I was forced to make do with Kosher salt. I’ve never made this particular recipe before, so I’m not sure how it usually turns out if you use table salt, but the measurements used here don’t exactly work with kosher salt! Because of this, I had to do some trial and error and ending up finding a balance that worked well for me. Thick paper for doodling on! We used cardstock. 2. Measure out 1/2 cup flour, 1/4 cup kosher salt, 3/4 cup water and stir together until it’s not lumpy at all. I learned the hard way that if there are any lumps…it will stop up the doodle bottle! 3. Add some food coloring or food gel to turn the paint the color you desire and mix it. I had to use a pretty decent amount of food gel to get the bright and vibrant colors I was going for! 4. Make sure the consistency is paint like. Not too thick, not too thin. Add a bit more water if it’s too thick. 5. Pour it into the clear bottle. 6. Doodle to your hearts content! Now, kids will enjoy these but I definitely recommend supervising this activity closely, especially if your kiddos are as young as mine. Guide your children to not squeeze too tightly and to spread the paint all over the paper. It does take awhile to dry and the thicker they put it on, the longer it will take. It’s a really fun activity though and if you can include your children in the making of the paint, it will make the experience that much more special! You might consider letting your kids use this paint in my “No Mess Allowed Painting” activity as well! Let me know if you try this out! I’d love to hear your results! You can put the wet picture in the microwave and the “paint” will puff. The amount of time depends on how thick the paint is and it is best done on a stuff paint or the picture will curl. Enjoy! Good to know! What time would you start off at? 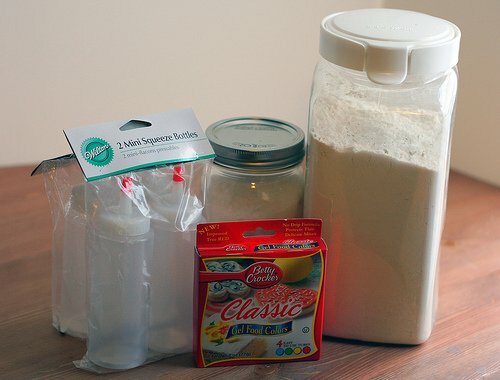 Has anyone made this with a gluten-free flour or cornstarch? I’m just wondering if there is a a gf option? I have not, but if you do try, let me know how it works out and I will update the post! Does it dry nicely? Enough to be made into a hanging photo? If you put it out in the hot sun, yes. I used regular all purpose! Do you need to refridgerate the paint?